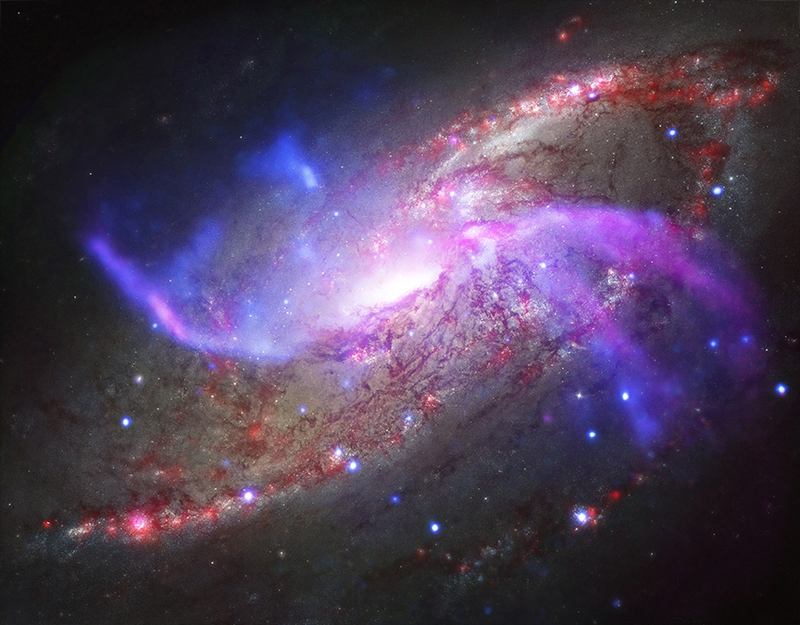 A new composite of NGC 4258 features X-rays from Chandra (blue), radio waves from the VLA (purple), optical data from Hubble (yellow and blue), and infrared with Spitzer (red). NGC 4258 is well known to astronomers for having "anomalous" arms that are not aligned with the plane of the galaxy, but rather intersect with it. Researchers are trying to understand how the giant black hole in the center of NGC 4258 is affecting the rest of the galaxy. NGC 4258, also known as Messier 106, is located about 23 million light years from Earth. A galaxy about 23 million light years away is the site of impressive, ongoing, fireworks. Rather than paper, powder, and fire, this galactic light show involves a giant black hole, shock waves, and vast reservoirs of gas. This galactic fireworks display is taking place in NGC 4258 (also known as M106), a spiral galaxy like the Milky Way. This galaxy is famous, however, for something that our Galaxy doesn't have — two extra spiral arms that glow in X-ray, optical, and radio light. These features, or anomalous arms, are not aligned with the plane of the galaxy, but instead intersect with it. X-rays from NASA's Chandra X-ray Observatory are blue, radio data from the NSF's Karl Jansky Very Large Array are purple, optical data from NASA's Hubble Space Telescope are yellow and blue, and infrared data from NASA's Spitzer Space Telescope are red. A new study of these anomalous arms made with Spitzer shows that shock waves, similar to sonic booms from supersonic planes, are heating large amounts of gas — equivalent to about 10 million Suns. What is generating these shock waves? 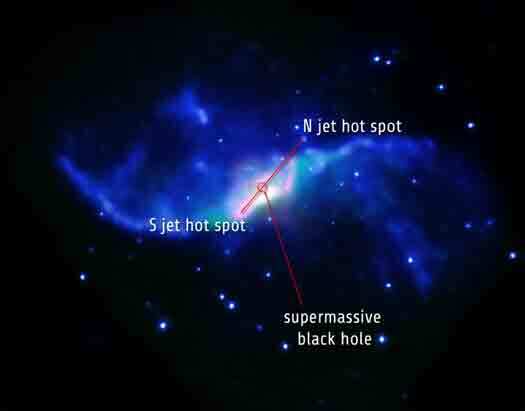 Radio data shows that the supermassive black hole at the center of NGC 4258 is producing powerful jets of high-energy particles. 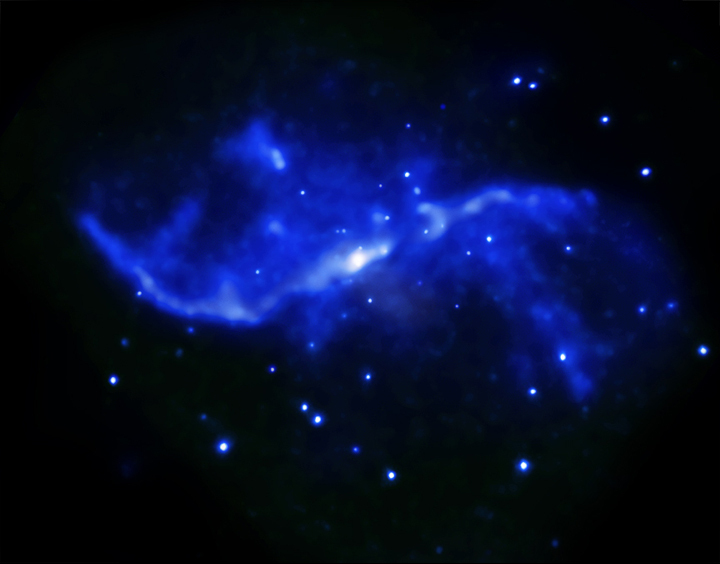 Researchers think that these jets strike the disk of the galaxy and generate shock waves. These shock waves, in turn, heat some of the gas — composed mainly of hydrogen molecules — to thousands of degrees. As shown in our additional, composite image, part of the evidence for this heating process comes from the similarity in location between the hydrogen and X-ray emission, both thought to be caused by shocks, and the radio jets. The Chandra X-ray image reveals huge bubbles of hot gas above and below the plane of the galaxy. These bubbles indicate that much of the gas that was originally in the disk of the galaxy has been heated to millions of degrees and ejected into the outer regions by the jets from the black hole. The ejection of gas from the disk by the jets has important implications for the fate of this galaxy. Researchers estimate that all of the remaining gas will be ejected within the next 300 million years &mdsh; very soon on cosmic time scales — unless it is somehow replenished. Because most of the gas in the disk has already been ejected, less gas is available for new stars to form. Indeed, the researchers used Spitzer data to estimate that stars are forming in the central regions of NGC 4258, at a rate which is about ten times less than in the Milky Way Galaxy. The European Space Agency's Herschel Space Observatory was used to confirm the estimate from Spitzer data of the low star formation rate in the central regions of NGC 4258. Herschel was also used to make an independent estimate of how much gas remains in the center of the galaxy. After allowing for the large boost in infrared emission caused by the shocks, the researchers found that the gas mass is ten times smaller than had been previously estimated. Because NGC 4258 is relatively close to Earth, astronomers can study how this black hole is affecting its galaxy in great detail. The supermassive black hole at the center of NGC 4258 is about ten times larger than the one in the Milky Way, and is also consuming material at a faster rate, potentially increasing its impact on the evolution of its host galaxy. These results were published in the June 20th, 2014 issue of The Astrophysical Journal Letters and are available online. The authors are Patrick Ogle, Lauranne Lanz and Philip Appleton from the California Institute of Technology in Pasadena, CA. I am speechless... Is it a dream? I was the designer working at MIT that helped to design the focal array for Chandra. It was a great experience. Hope it was worth the science. Thanks Robert, we will check it out and get back to you shortly. Can I download a High resolution version of the optical wavelength only? Hi, I'm not certain but I believe my name might belong in the credits for this image. I out together the Optical image of M106 for the Hubble Heritage team back which was released in February 2013. See below. That was the most interesting thing I have never read before I mean how fantastic is the universe and what I liked most was the part of anomalous arms it's strange to find them not perfectly alined... in conclusion I don't know how could I live without this website. A spiral galaxy, also known as M106, about 23 million light years from Earth. About 23 million light years. X-rays from Chandra, radio waves from VLA, optical data from Hubble & infrared from Spitzer. Image is 6.6 arcmin across (about 44,000 light years). X-ray (Blue); Optical (Gold, Blue); Infrared (Red); Radio (Purple).